Gordan Grlić Radman was born on June 6th, 1958 and has been serving the Republic of Croatia as Ambassador to Germany. In 1982 Grlić Radman received a certificate from the Management School in Bern, Switzerland. He then stayed in Switzerland and co-founded the NGO Croatian Swiss Business Consultant. Grlić Radman eventually returned to Croatia and completed a Masters in Political Science in 2002 and a Doctorate in 2007. After receiving his Doctors, Grlić Radman started working for the Ministry of Foreign Affairs in embassies in Sofia, Bulgaria and Budapest, Hungary. 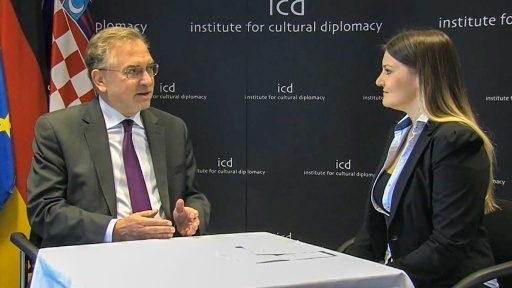 He is currently the serving Ambassador of Croatia to Germany. Grlić Radman speaks Croatian, German, English, Bulgarian, and Hungarian. Croatians form the 6th largest ethnic minority in Germany. The Croatian Embassy estimated that there were about 350,000 Croatians and their descendants living in Germany in 2014. Therefore, the embassy’s role in Berlin is important. In addition to the embassy in Berlin, Croatia has seven other representations in Germany. These representations include consulates in Dresden, Düsseldorf, Frankfurt am Main, Hamburg, Mainz, Munich, and Stuttgart.